As an outreach effort of Indonesia’s OGP chairmanship, Tara Hidayat, Deputy Head of President’s Delivery Unit on Development Monitoring and Oversight, met with the State Secretary for Governance and Civil Services of Tunisia, Mr. Annouar Ben Khelifa, during her visit on 19-23 June. Mr. Annouar Ben Khelifa shared some progress of Tunisia’s OGP participation in the meeting. Not only that Tunisia has started seeking inputs on-line for its OGP commitments, it has received over 100 inputs in just a week time. Tunisia is currently setting up its national OGP committee, which will not only include government and civil society but also private sector and academia. Indonesia has also extended an invitation for Tunisia to attend the OGP High Level Event on the sidelines of United Nations General Assembly (UNGA) on September 23rd in New York. Mrs. Hidayat expressed that it would be a great opportunity for Tunisia to represent Middle East & North Africa region to announce a new commitment on civic participation and also to participate in OGP Awards. Mr. Khelifa and Mrs. Hidayat also discussed a few other issues such as Indonesia’s chairmanship theme on role of private sector & youth, challenges in planning and implementing OGP, and Tunisia’s civil society engagement plan. 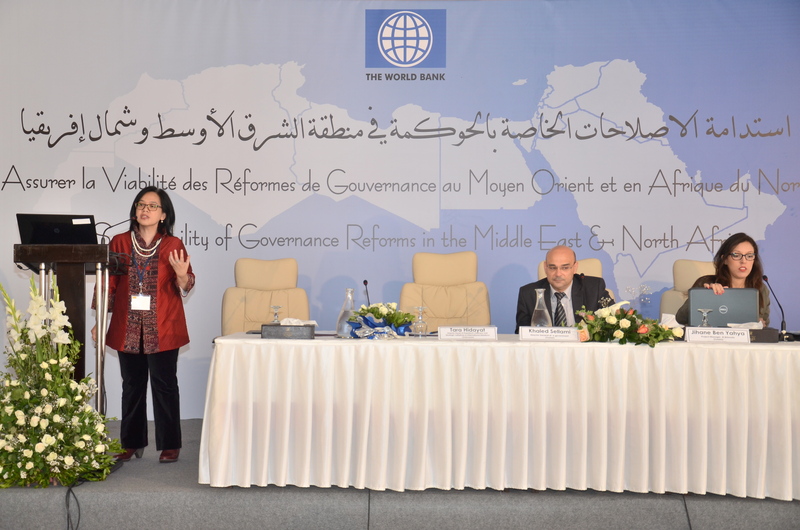 Aside from the meeting, Tara Hidayat participated in the World Bank’s Regional Governance Workshop for Middle East & North Africa (MENA) region from 19 – 21 May 2014 with the theme of ‘ The Sustainability of Governance Reforms in the MENA region ’, along with participants from 11 other countries (Tunisia, Morocco, Libya, Lebanon, Palestine, Egypt, Iraq, Jordan, Yemen, Mexico, Portugal). Mrs. Hidayat was among the panelist for the session on ‘Promoting Accountability through Open Government’. Within the panel, she shared about the process, progress, and benefits, of OGP from Indonesia’s own experience. Though there are only 3 participating members of OGP in MENA region (Jordan, Israel, and Tunisia), there’s an ample of spirit towards a more open government seen from discussions during the workshops. Tunisia, joining OGP January this year, is currently in the process of developing its action plan and aims to have draft commitments ready by September 2014. Indonesia looks forward to seeing more countries in MENA joining the efforts towards open and accountable government.